CREATIVE WRITING NOTES: Writer's Block? A friend of mine suggested this QWERTY exercise to help remove one. "Use 26 words, no more, no fewer, the first letter of each word to be the letters on your keyboard taken in order, left to right, top row to bottom row. Seriously, if you can do that, you can do anything." I made a couple of starts, but it kept turning unpublishably odd. A most amusing exercise. "Questioningly, we exerted release touch yoni upon Ignace. Per a stipulated defenestration, Gerda high-jumped. Killed? Luckily, ze xylophone clonked, violently, but not much." Hmmm. Well, that's what the word gods said to me. A clear demonstration of the fact that, although divinely inspired, my IQ is definitely sub-150. That was fun! I think. So thanks for it. Off to flip through the rest of this spot with coffee #2. I missed a letter, too! Make that "Frau Gerda" and "sub 100". "Quite wonderful. Exactly remembering the yoked underlings in other places. Adonis said, "Don't find green hay just kicking like zealous Xerxes. Could vex berserk nuns, mostly." It's the "K", "X" and "Z" that throw the punters into disarray, invoking Greek gods, botany, strange European names and so on. Try something easier. 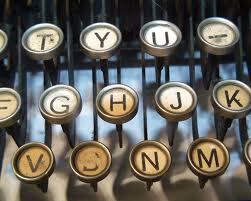 Make the QWERTY letters the first letter of successive lines on a 26 line poem. Good luck, but don't waste too much valuable writing time. I haven't actually done this, but I have heard of the alphabet challenge, which is very similar. You start each sentence with the next letter of the alphabet (obviously starting with A, and carrying on to B, etc. ).